Clear Digital Media recently unveiled their redesigned website: http://www.ClearDigitalMedia.net. CDM’s new site was shown earlier this month by Brad Dodson, Vice President of Sales & Training, in booth #404 at the Academy of Doctors of Audiology Convention at the Hyatt Regency Capitol Hill in Washington. 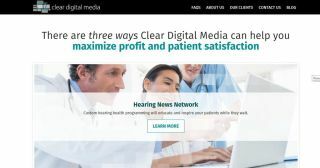 CDM’s website was redesigned to display the company’s three main goal: delivering specific content at the point-of-care in hearing health clinics, provide a platform to present customized hearing health information in the waiting rooms of physicians, and offer video content at lower prices. The new website makes navigating CDM’s marketing tools easier than before. The CDM website teaches visitors and provides a place to purchase subscriptions, downloadable content, search physicians’ screens in their area, and request a quote for advertising on those screens. CDM is also introducing a custom content section and a new offering called HNN2GO. HNN2GO allows the customization of any piece created by Hearing News Network, a patient engine that creates educational and informational content to the waiting room in real time. It allows changes to be made instantaneously and remotely, and for content to be posted directly to social media accounts.